In August 2018, Lifesize introduced the concept of “one-time meetings” to the Lifesize Cloud, providing users and organisations a way to launch single-use Virtual Meeting Rooms (VMR’s) that are hidden from the directory and intended for non-recurring events. Expanding the versatility of Lifesize’s VMR feature is already being generously welcomed by both partners and customers alike – a one-time meeting feature has often been requested in the past and has been a manual and time-consuming “slightly-bodged” process in the past when organisations wanted or required the functionality. 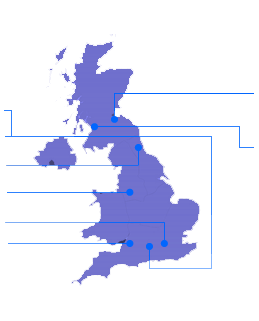 With the release, users get flexibility and choice when creating VMR’s, dependent upon whether it’s likely to be a regularly used virtual meeting space (with the same dial number/security access) or whether the space should be for a single time use, disappearing once used and unable to be accessed by guests or users at a later date. So what would the benefit of this be? Private Conversations with No Accidents! For organisations holding meetings with the public and guests, it’s important that these VMR’s aren’t then reused by others at a later date, or reaccessed by a past meeting participant when holding another future private meeting with another guest or client. Similarly, private internal meetings i.e. personnel reviews and appraisal meetings can be kept out of the diary, and individuals cannot accidentally appear in someone elses review session – solving what could become a privacy and human resource nightmare! Plus only the owner and moderator of the VMR can see the meeting space in the app – ensuring those private discussions can be had… in private. Jump into an ad-hoc meeting quickly without the hassle of managing a meeting limit for your account or cleaning up older meetings from the directory. Users can create unlimited one-time meetings that never show in the global directory and are delete after the meeting has ended – making them quick to create and even quicker to manage. One-time meetings are available in the Lifesize web and desktop apps, and from the Lifesize outlook add-in for customers who have purchased the one-time meeting add-on feature. Create a one-time meeting via the meeting directory in the app, or send invites via the “Schedule a Meeting” button in the Microsoft Outlook home ribbon. Find out more about How to schedule a one-time meeting in Lifesize’s guide here. Contact Lifesize Gold Partner VideoCentric, if you are interested in a free trial of Lifesize Cloud with the one-time meeting feature, or would like to learn more. 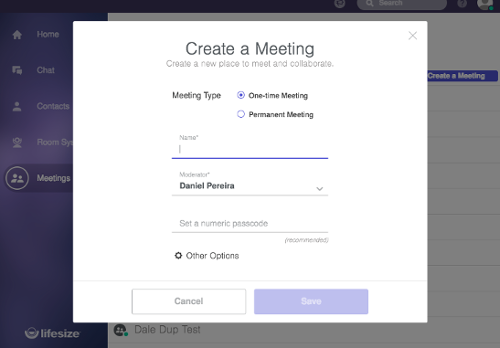 The one-time meetings add-on is an account level feature. Once enabled, all users in your account who have the latest version of the Lifesize Outlook add-in for Windows® and are using the new web or desktop apps will have access to create and schedule one-time meetings. Great feature, and will declutter the ever growing list of VMRs that are never used again!